I’ve been on a modern hair metal high lately. After thinking the well was beginning to dry up, in the past few months I’ve come across great bands like Reckless Love, Bad City and now the London-based Jettblack. All three bands have an obvious love for glammed-up ’80s rock/metal but all display that love in different ways. 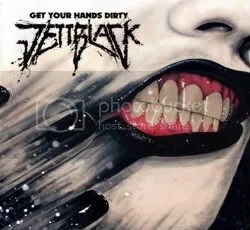 While Reckless Love dives head first into the cheesy AOR side of ’80s metal and are content to keep a completely retro sound, Jettblack (much like Bad City) does the glam thing while balancing it with a modern hard rock sound. The album starts off with the fantastic “Slip It On”, which is pure ’80s pop metal. “Two Hot Girls” features the typical lyrics you’d expect from a band that has been influenced by glam metal and “When It Comes To Lovin'” is a fun song talking about nailing your friend’s sister. Numbers like “Not Even Love”, “Sleep”, “Holding” and “Innocence Is Mine” show a heavier, modern and sometimes moodier side of the band that’s equally as cool, melodic and catchy as any of the more nostalgic sounding songs. Unlike the band Endeverafter, somehow Jettblack manages to pull this pop metal/modern hard rock blend off perfectly. The album never comes off sounding disjointed or like it was recorded by two different bands. I’ve read some reviews disagreeing with me on just how well the album plays as a whole but you can’t please everyone, I guess. Of course, a song like “Slip It On” is NOT going to get played on the radio in 2010 (well, not in America at least) but “Not Even Love” and the slow-burning “Innocence Is Mine” could easily find their place on the mainstream rock stations and be hits if only someone would give the band half a chance. Of course, the first step is getting this album a distribution deal in the States, which hasn’t happened as of this writing. I had to track down a used copy on Amazon and ended up paying $13.95 for it but it was worth the price as in the 5 or 6 spins I’ve given this album, it’s become one of my favorites of the year.